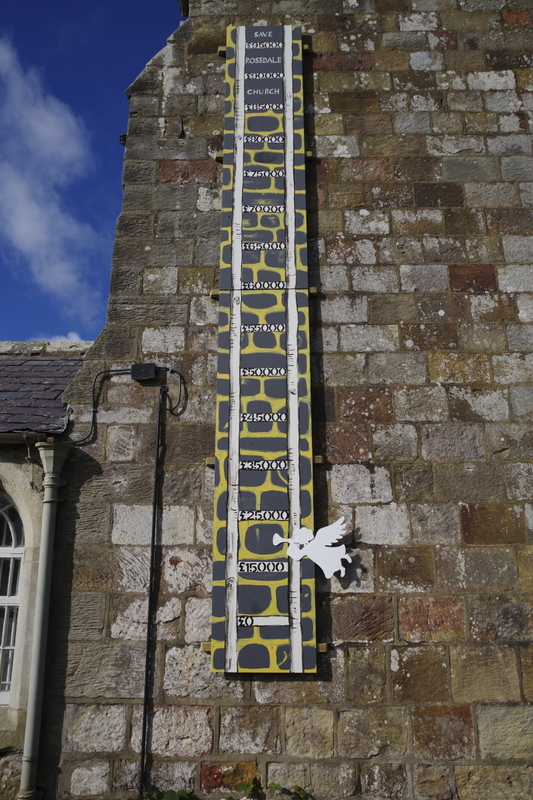 The Angel on the Celestial Ladder on the side of St Mary and St Lawrence Church has been moved up a notch as a result of the outstanding £5000 raised at the the recent Flower Festival. 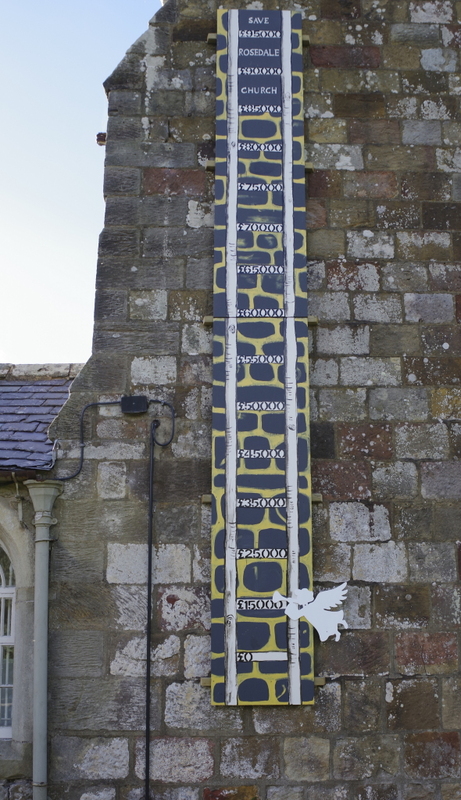 The fund raising effort continues as can be seen from the height of the ladder. 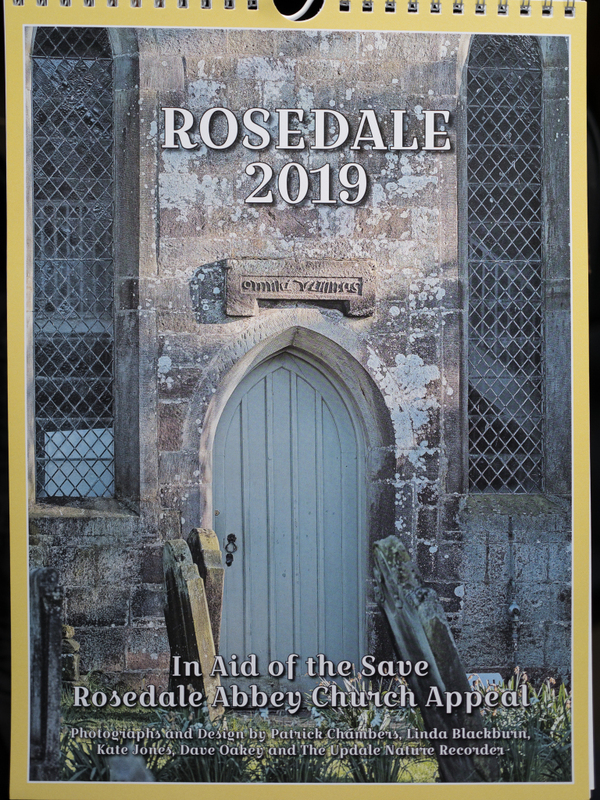 Cards, notebooks and the Rosedale 2019 Calendar are available from the Abbey Stores, Graze on The Green tearooms, the Coach House Inn, Gillies Jones Glass and the Caravan Club site shop. Also keep a look out on this site and on social media for further news about fundraising events for this vitally important cause. So far over £4800 (and rising) has been raised through donations and sales, a tremendous result and a fitting tribute to all the hard work of the volunteers who set up and helped throughout the festival and especially to the astonishing generosity of all who donated money to the Appeal – it is hoped that the Angel can now be raised a few notches up to the £20,000 mark on the Celestial Ladder (see the exterior wall at the east end of the church). 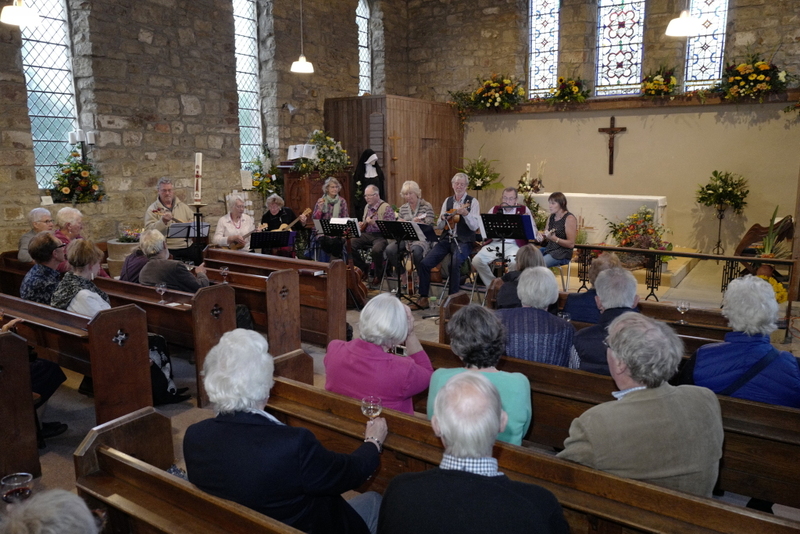 A preview evening was held for the Flower Festival on Friday 14 September 2018 in aid of the Save Rosedale Abbey Church Appeal. 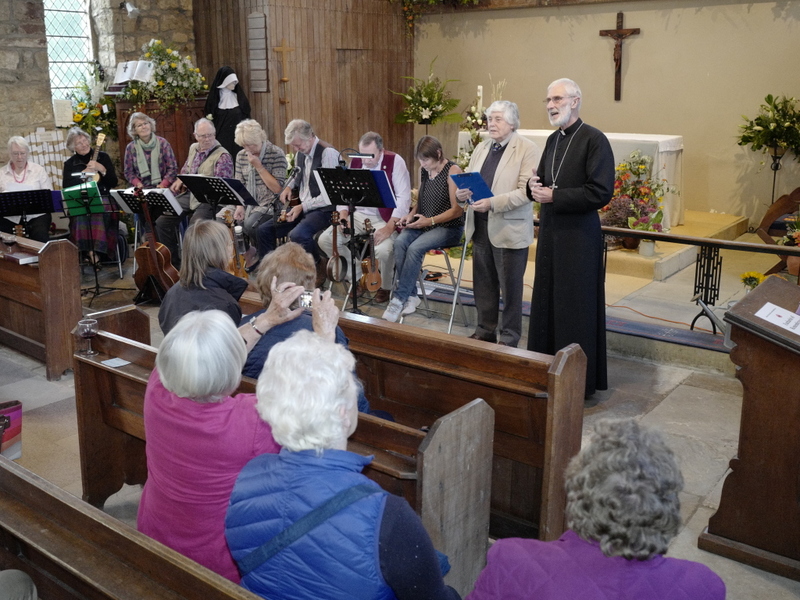 Close to a hundred people, visitors and locals, attended and enjoyed a very convivial event and were royally entertained by the Eskuleles ukelele band. 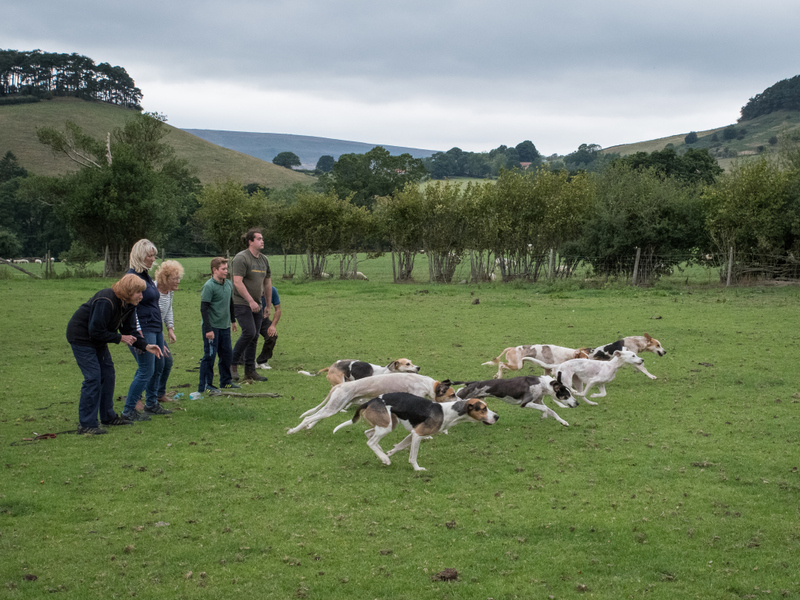 The Eskuleles in full flow. 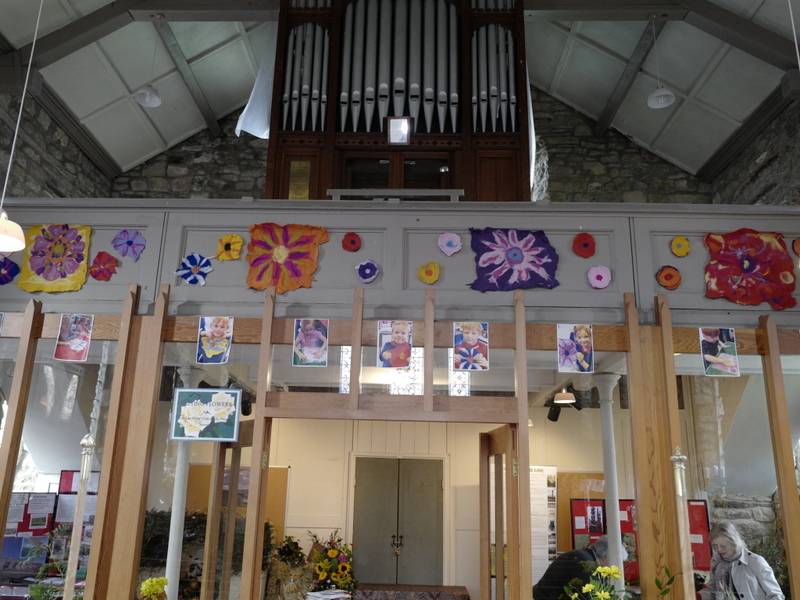 Over £600 pounds was raised from donations and sales of Appeal related merchandise, an excellent effort by all involved. 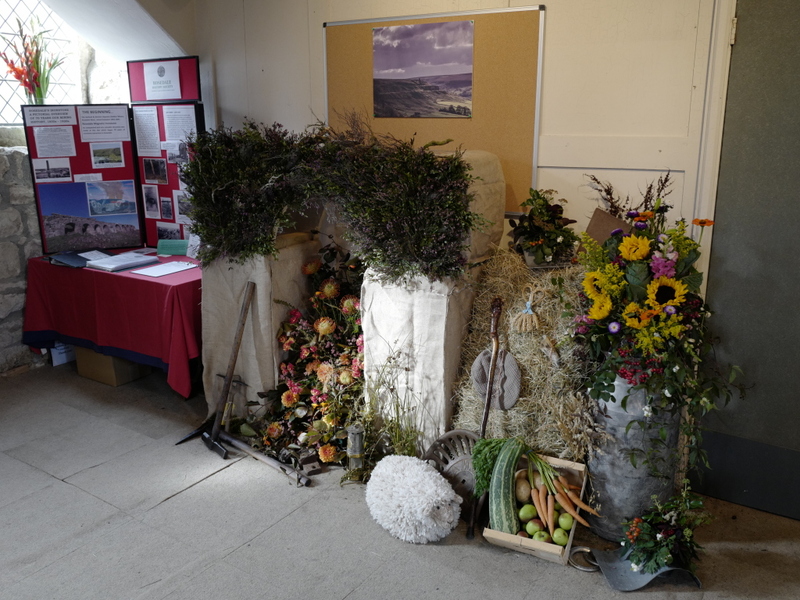 Thanks go to all who helped set up the the displays and who who contributed to the Appeal on the evening. 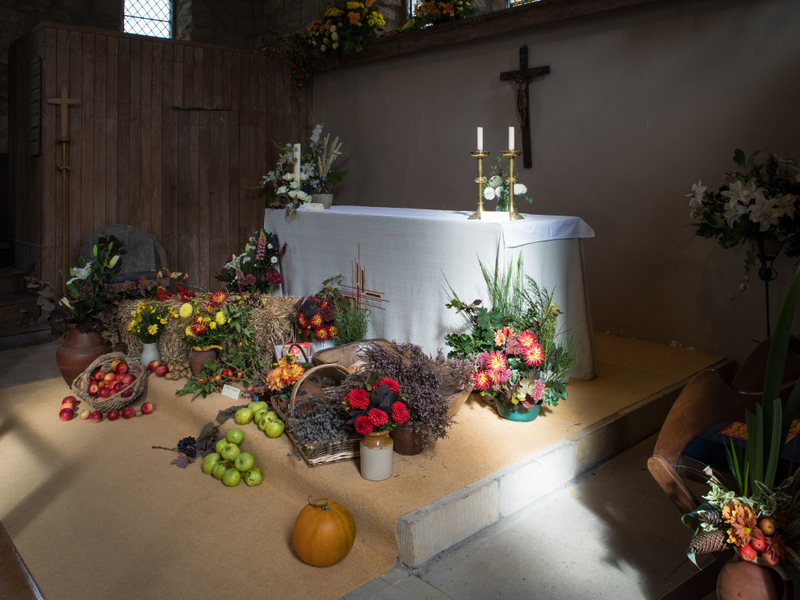 Please remember the church will be open to view the wonderful displays by local groups from 10.00am to 5.00pm each day through to Sunday 23 September, with the Harvest Service followed by a Bring-and-Share supper on Saturday 22 September starting at 6.00pm. 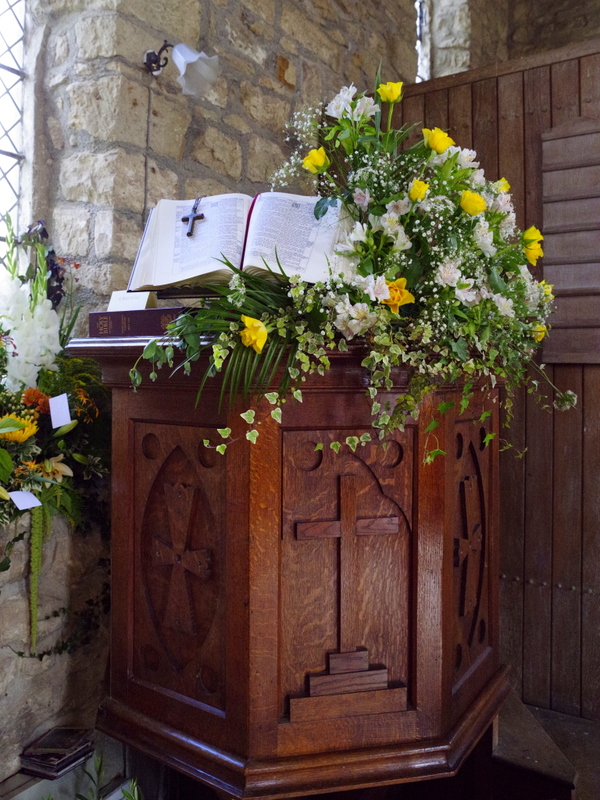 All are very welcome to St Mary and St Lawrence Church. 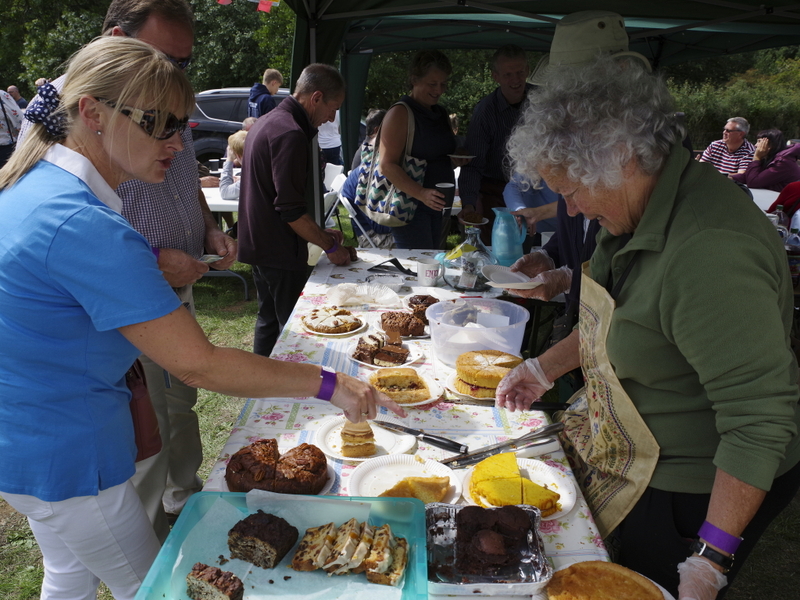 On Show Day, the church tea and cake tent made £2074 for church funds, with additional donations and sales of cards, calendars and roof slate sponsoring bringing in another £655 for the Save Rosedale Abbey Church Appeal – a terrific result all round. 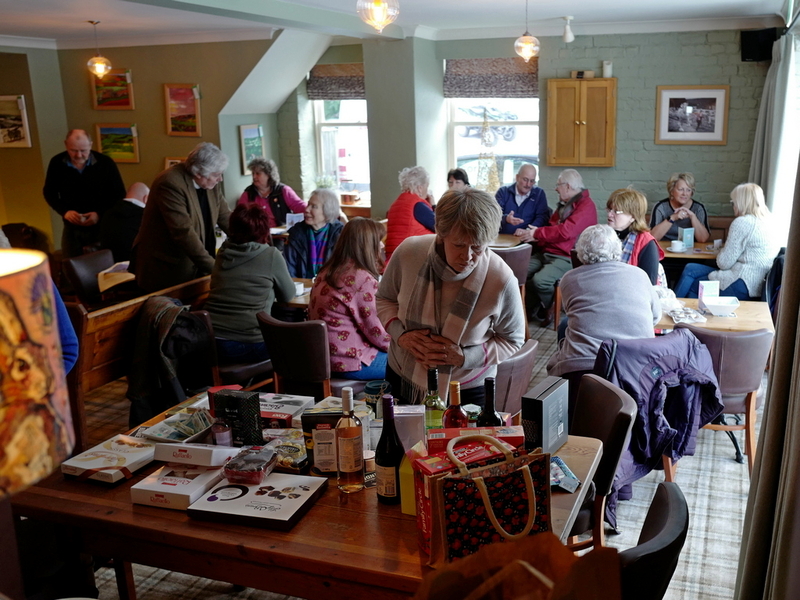 Congratulations to all the community volunteers who baked a seemingly endless supply of delicious cakes and helped to raise so much money for the church and our appeal. 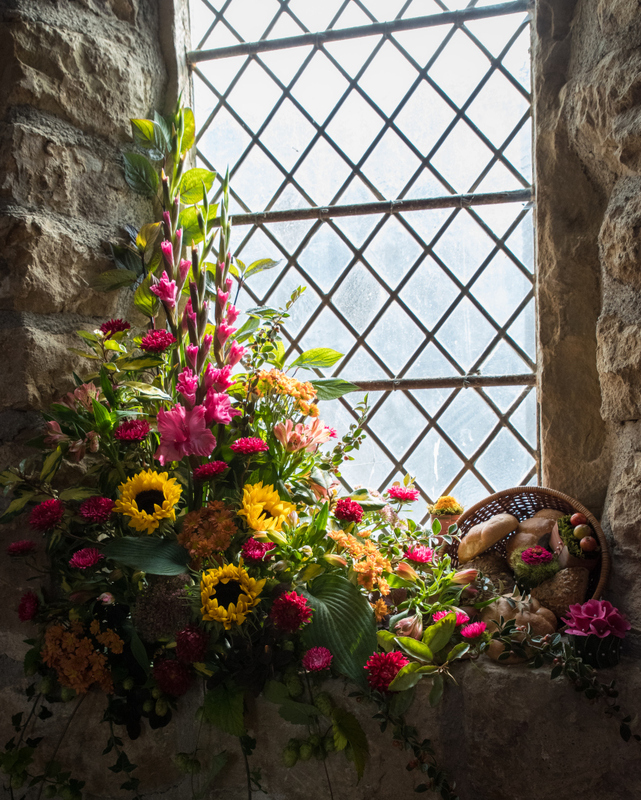 Please note for your diaries, the Rosedale Flower Festival on 15 to 23 September, with the Harvest Service on Saturday 22 September at 6.00pm followed by a bring and share supper. More details here and on social media. 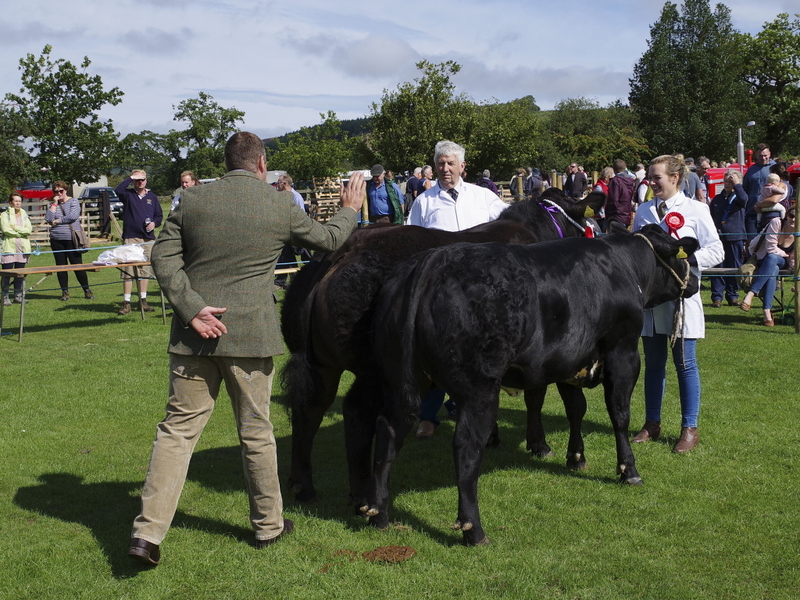 Some fatherly advice before the judging. 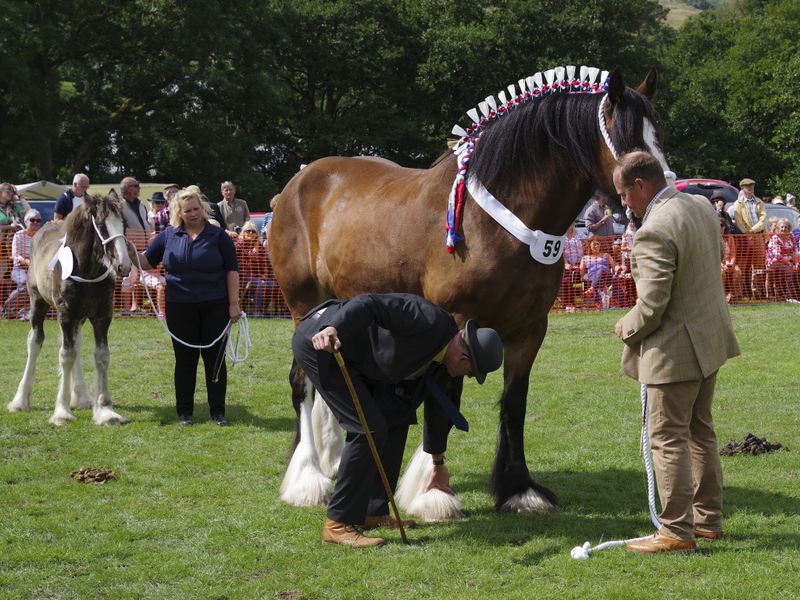 A perennial favourite – the heavy horses judging. 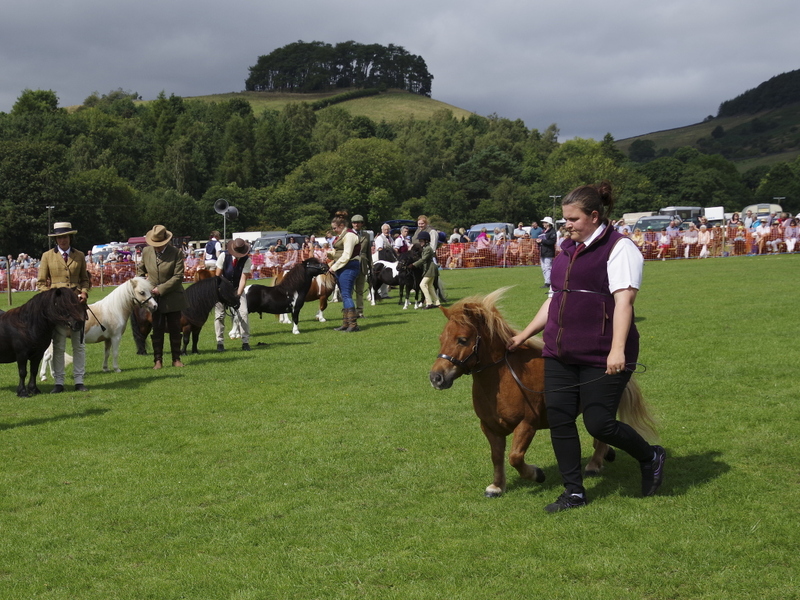 In contrast, the smallest horses on show. 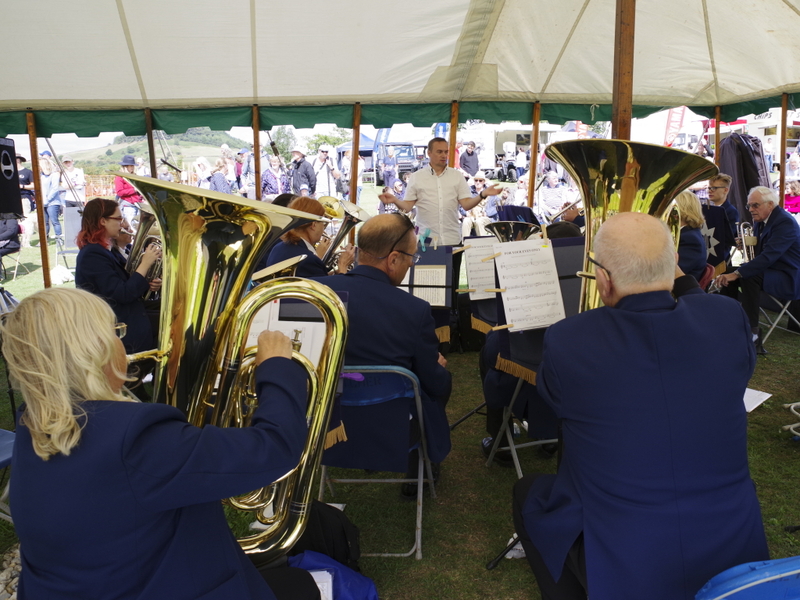 “I’ll have some of that, please.” At the church tea tent. For Your Eyes Only – the music, that is! 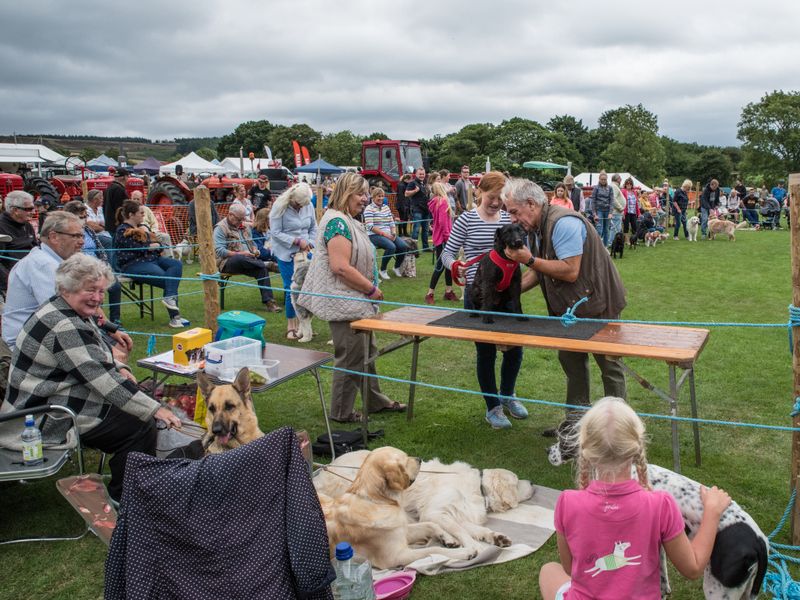 Dogs everywhere – in and out of the judging ring. More dogs – at the start of one of the hound trail races. 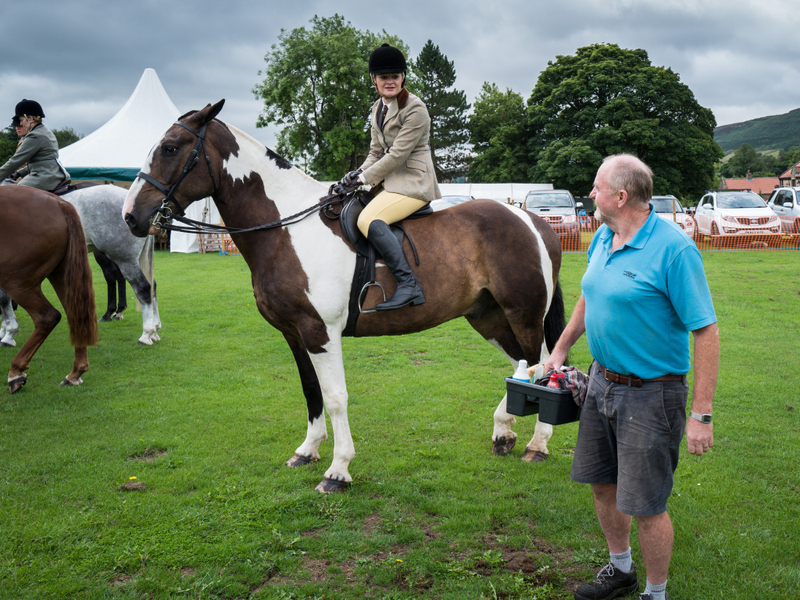 The show could not be run each year without the sterling efforts of Sam Dring and her committee and all the volunteers who help put up and take down the showground, who man the gates and direct traffic – heartfelt thanks to them all. 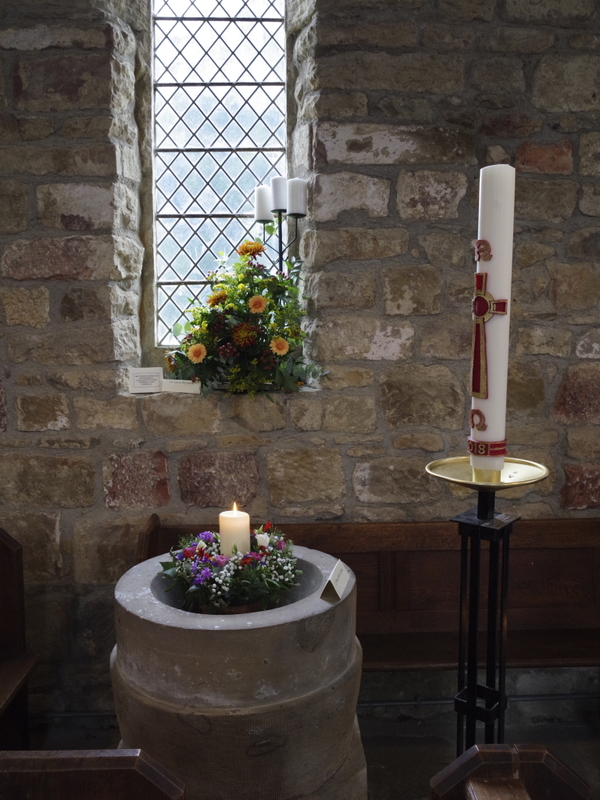 Also, a reminder of the Rosedale Flower Festival in aid of the ‘Save Rosedale Abbey Church Appeal’ which will be in the church of St Mary and St Lawrence from 15 to 23 September with a Harvest Service and Supper at 6.00pm on Saturday 22 September – all are very much welcome. 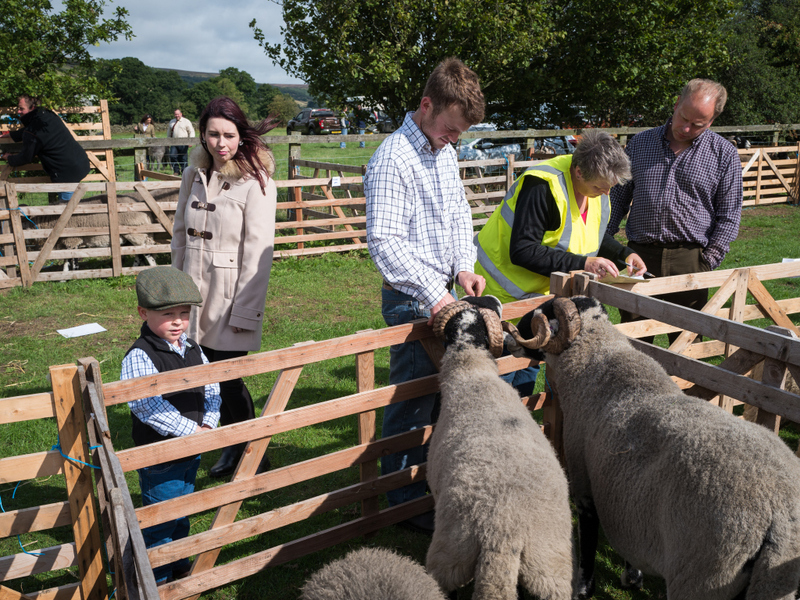 The very popular Rosedale calendar is available again. 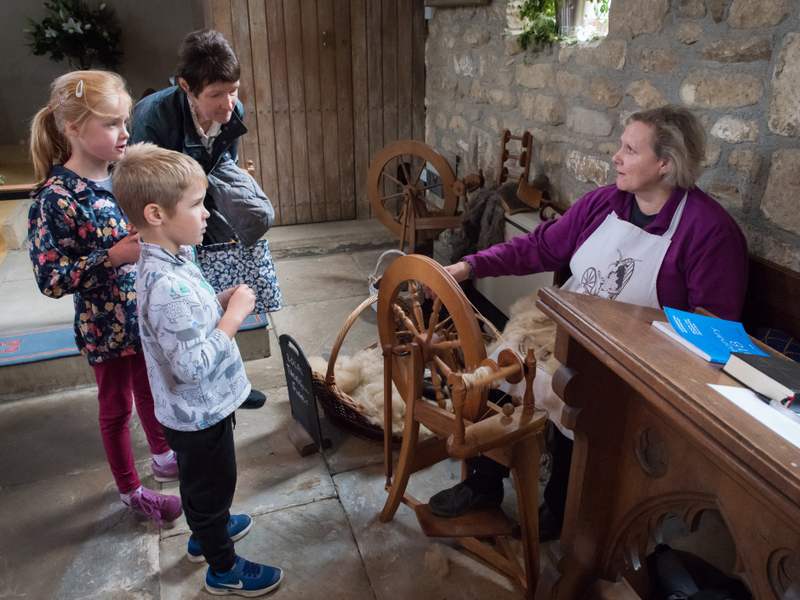 The 2019 calendar is on sale now in Abbey Stores, the Coach House Inn, Gillies Jones Glass Studio, Graze on The Green and the Caravan Club shop for £10 per copy with envelope. 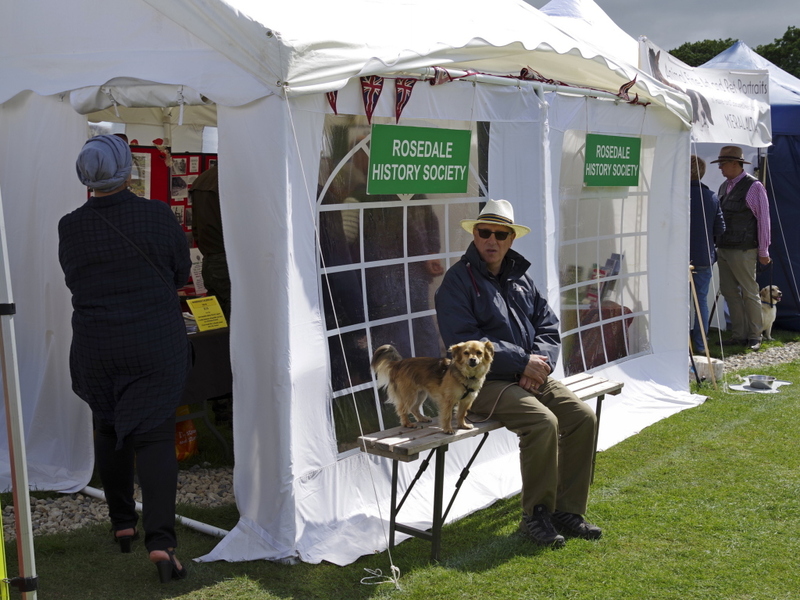 The calendar will also be on sale in the Rosedale History Society tent (Row F 4) and in the church tea tent at Rosedale Show this coming Saturday. 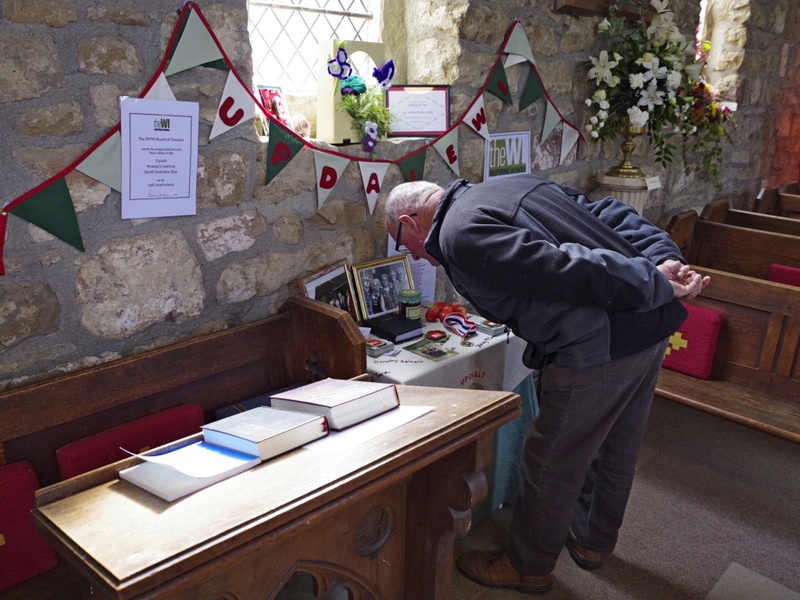 This year there are five local people who have contributed photographs, so you can try and guess who’s is which image or images. 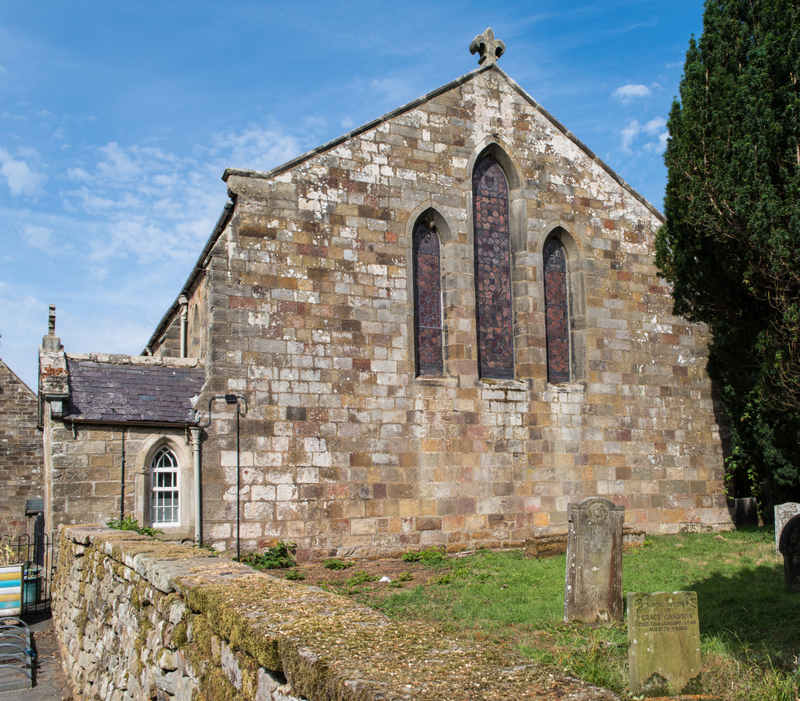 And every pound raised goes towards the restoration of St Mary and St Lawrence Church. 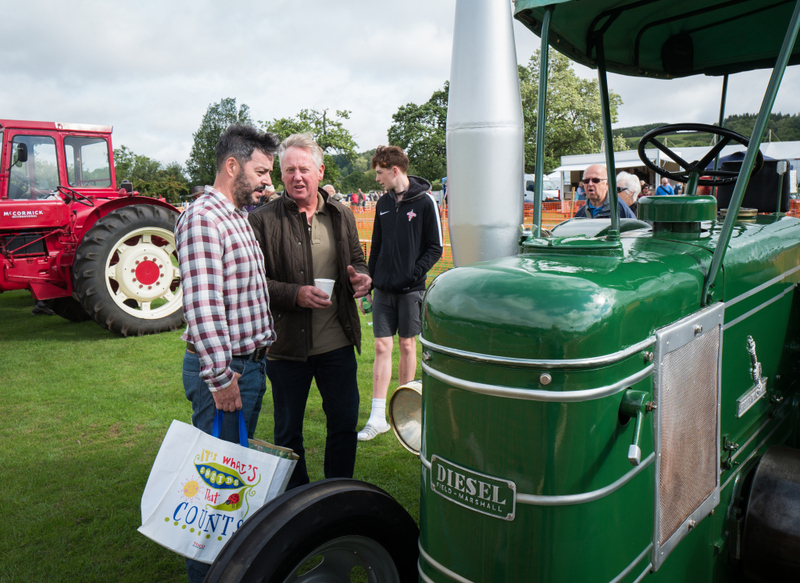 These calendars are finished to a very high standard and are practical momentos of a year in the life of our dale and ideal for giving as gifts and Christmas presents. Last year we had to do a reprint as they proved to be so popular, so buy yours as soon a possible! A view of our church that has not been seen in decades, now that elders, hollies and brambles have been cleared. 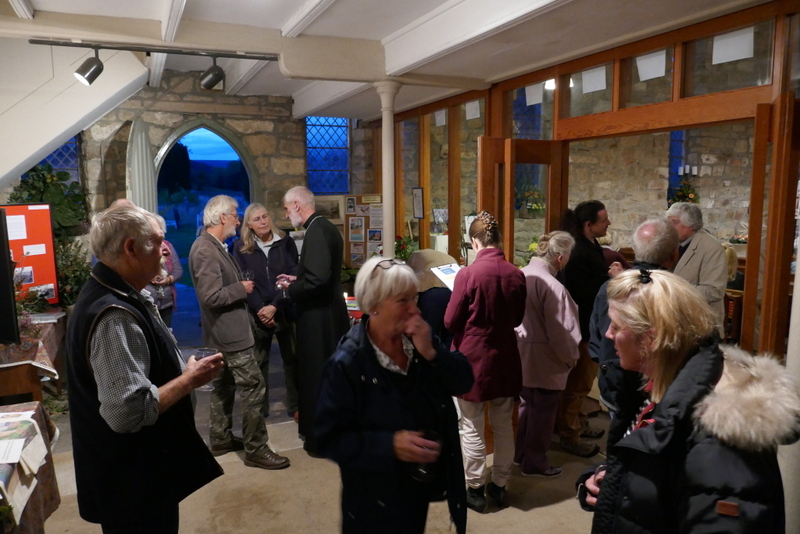 Work on the appeal to raise funds for the vitally need church repairs continues. 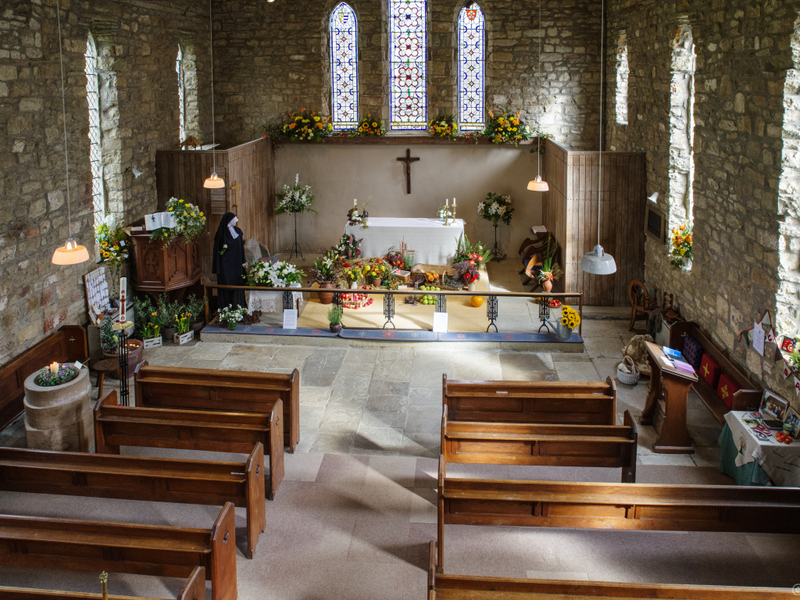 Cards and notebooks are on sale in Abbey Stores and Graze on The Green and the new Rosedale calendar for 2019 will be available shortly in the tea shops, but also in the Coach House Inn, Gillies Jones Glass Studio and from the Rosedale History Society tent and the Church tea tent at Rosedale Show on 18 August.